I need you to take 30 seconds out of your busy day or this will probably be the last podcast you ever hear from me. To get new episodes and get your FREE MP3 preloaded MP3 player, subscribe at www.marketinginyourcar.com. Follow these 9 steps to get more attention and cash! On today’s episode Russell talks about his trip to Kenya and the nightmare of getting back home and being stuck in airports for 56 hours. He also talks about a street show he witnessed in Amsterdam that was filled with golden marketing lessons. Find out how the trip to Kenya went, the purpose behind it, and how as a Clickfunnels member you are contributing to helping kids there. Hear about why it was important to get home from Kenya on time and how everything went wrong. And finally hear about a street performer that impressed Russell with his marketing skills and find out how that can help you. So listen below to find out the valuable marketing lessons Russell learned from a street performer. How to know when to stop. On today’s episode Russell explains why you need to be able to consistently and profitably generate customers, or you are in the wrong business. How to recognize if your business is a sinking ship you need to bail on. What else you need to know besides being able to consistently and profitably generate customers in order for your business to be successful. And why every business needs consistent work in order to avoid deterioration. So listen below to find out how you can tell if your business will grow or deteriorate. The real reason why I’m documenting all of this cool stuff. On today’s episode Russell talks about why Snapchat is valuable because you can see behind the scenes of how much stuff he is able to get done in a day and why that should be a motivator for you. He also talks briefly about Funnel Graffiti, which is coming soon. 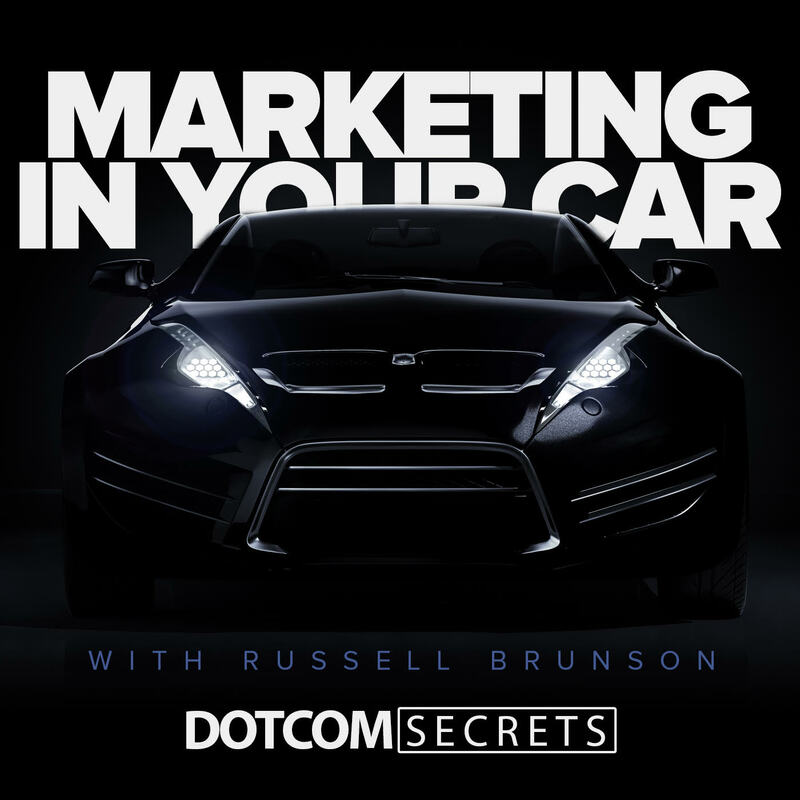 The difference between Russell’s Snapchats and the Marketing In Your Car podcast and why each is valuable. Why being efficient with your time is necessary if you want to be able to get lots of things done. And why watching Russell’s Snapchats will help motivate you to cram more things into your day and be able to get it all done. So listen below to find out how you can use your time more efficiently. Carpe Diem… seize the day! In this episode Russell talks about driving home from a family vacation and thinking about how the window of life is a short one and how we need to seize the day by creating. He also talks about his favorite part of Dead Poets Society and why it is important. Why Russell thinks it is so important to look at life as a short window of time that we have to create something of impact. Why Russell believes that despite being born under different circumstances we all have shockingly similar trials. And why creating things that will help others is the secret to happiness. So listen below to hear what Russell believes about our short time on Earth and why it is important. Let me walk you behind the scenes of the Biohacking Secrets sales funnel’s numbers. On today’s episode Russell walks you through the math of internet marketing and how you can test a products profitability. He uses the recent launch of the Biohacking Secrets funnel as an example. Why Russell’s favorite part of the launch process is the same part that most people stress out over. How to figure out your cost to acquire a customer, and your average cart value and how to use those numbers to figure out if you are profitable. And some tweaks you can make to lower your cost per customer and therefore increase your average cart value. So listen below to find out how Russell tweaks things to make sure his products are always at break even. How showing us consume our own products is driving revenue. On today’s episode Russell talks about how doing Funnel Fridays has helped show people how to consume Funnel Scripts and has ended up helping tremendously with sales. He also tells a funny story about a product launch with an unexpected problem. How Funnel Fridays have helped sell Funnel Scripts. Why it’s important for your customers to become engaged with your company. And find out the details of a funny story involving Anik Singal and a product launch. So listen below to find out why you should be watching Funnel Fridays and why you should be doing something similar with your own business. If you can use this one secret, you can sell anything. On today’s special LA version of Marketing In Your Car, Russell and Dave Woodward talk about how Russell nearly spent $33,000 on a rare copy of The Book of Mormon and why he felt like he had to have it. Find out what kind of items Russell searches for on Ebay. Find out why he was willing to spend such a large amount of money on a book. And see what this experience taught him about marketing and how he’s going to use it in his business. So listen below to find out what kind of stuff Russell buys on Ebay and why he’s willing to spend some serious cash on a book. Uh oh, no posts were found. What you searched for doesn't have any posts. If you feel it's something you should see on the DotComSecrets blog than email us to let us know and we'll respon within 24 hours. "Weird Marketing Experiments That Increase Traffic, Conversions and Sales Online"
Get Daily Marketing Test Results Sent To Your Inbox. Russell started his first online company while he was wrestling at Boise State University. Within a year of graduating he had sold over a million dollars worth of his own products and services from his basement! For over 12 years now Russell has been starting and scaling companies online. He is a best selling author, owns a software company (ClickFunnels), a supplement company, a coaching company (DotComSecrets), and is one of the top super affiliates in the world. DotComSecrets was created to help entrepreneurs around the world to start, promote and grow their companies online. ClickFunnels is the tool that makes it all possible. You're Just One Step Away From Joining! YOU UNDERSTAND THIS TO BE AN EXPRESSION OF OPINIONS AND NOT PROFESSIONAL ADVICE. YOU ARE SOLELY RESPONSIBLE FOR THE USE OF ANY CONTENT AND HOLD SUCCESSETC.COM, LLC. AND ALL MEMBERS AND AFFILIATES HARMLESS IN ANY EVENT OR CLAIM. YOU CAN ALSO SAFELY ASSUME THAT I GET PAID ANYTIME YOU CLICK ON A LINK ON THIS SITE. WE RECOMMEND THAT YOU DO YOUR OWN INDEPENDENT RESEARCH BEFORE PURCHASING ANYTHING.